A steamy mug of Hot Chocolate is a welcome treat on a snowy day. I have always enjoyed the simple task of standing at the stove heating milk and chocolate until the chocolate melts and the milk becomes hot and foamy. Oftentimes I like to insert an immersion blender into the hot liquid and whip it until it becomes even more frothy. To me, the real secret to this drink's success is a large dollop of whipped cream floating on the top. The contrast of hot milk and cold cream is delightful. I like this hot chocolate so much that I often make a double batch and then store leftovers in the refrigerator so I can quickly microwave a mug any time a craving hits. Now a good cup of hot chocolate is dependent on both the type (bittersweet, semisweet or milk) and brand of chocolate, as well as the fat content of the milk (full fat, reduced fat, or skim). Both of these ingredients affect both the flavor and the richness of the hot chocolate. So experiment with different types and brands of chocolate until you find one you like. Use either milk or cream, or a combination of both, to get the desired richness and creaminess. The adventurous may even like to add a stick of cinnamon or maybe a dash of chili pepper to the warming milk and chocolate. Vanilla or chocolate extract will also add a nice flavor. And the coffee lover can enjoy a mocha flavor by simply replacing some of the milk with freshly brewed coffee. Drinking chocolate is steeped in history. Columbus is credited with being the first to discover chocolate. When he arrived in the New World in 1502 he found the Aztecs drinking a chocolate beverage made with cocoa beans from the tropical tree Theobroma which translates to "Food of the Gods". Although the Spaniards found the beverage too bitter tasting for their palates they were amazed to see the Aztec's emperor, Montezuma, consuming up to 50 cups a day. The Aztecs made the beverage by first roasting and then grinding the cocoa beans to a paste, and then adding the paste to water, along with chili peppers and vanilla. Columbus did take cocoa beans back to Spain but they were not well received. It wasn't until Hernando Cortez brought more of the cocoa beans back to Spain from his trip to the New World (sometime around 1520) that the Spaniards found a way to process the beans to make them more palatable. They did this by adding sugar and spices (vanilla, cinnamon, cloves, hazelnuts, almonds, orange flower water) to the chocolate paste. Once the paste was allowed to solidify it was added to water or milk. This drink immediately became popular with the Spaniards and eventually the beverage spread throughout Europe and eventually to North America. Hot Chocolate: Place the milk, semisweet chocolate, milk chocolate, and sugar (if using), in a saucepan over medium heat and whisk constantly until the chocolate melts and the mixture just reaches the boiling point. Remove from heat and if more foam is desired, use a wire whisk or hand held immersion blender to whip the hot chocolate. 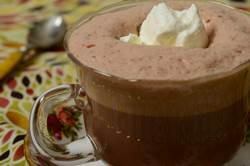 Pour the hot chocolate into two cups and garnish with a dollop of whipped cream or marshmallows. If desired, sprinkle with some grated chocolate or a dusting of cocoa powder. Preparation time 10 minutes. Whipped Cream: In your mixing bowl, place the whipping cream and sugar and whisk until stiff peaks form. Note: To make hot or iced mocha simply replace 1/2 cup (120 ml) milk with your favorite brewed coffee. Proceed with the recipe and if you want it iced, let the mixture cool and then pour over ice cubes. Garnish with whipped cream and grated chocolate. Note: Leftovers can be covered and stored in the refrigerator for a couple of days. Reheat. Makes 2 - 8 ounce (240 ml) servings.